Those look great, what powder coat company do you use? this will be a slow project but I'm starting to collect parts. You really should try to mount the engine with the stock B4 mounts. I'm 95% certain the passenger side is the same. People use the same passenger mount to get a 1.8t in both the B3 and B4. Driver's side looks to be off, but only by a small amount. It was nice meeting you Ben! 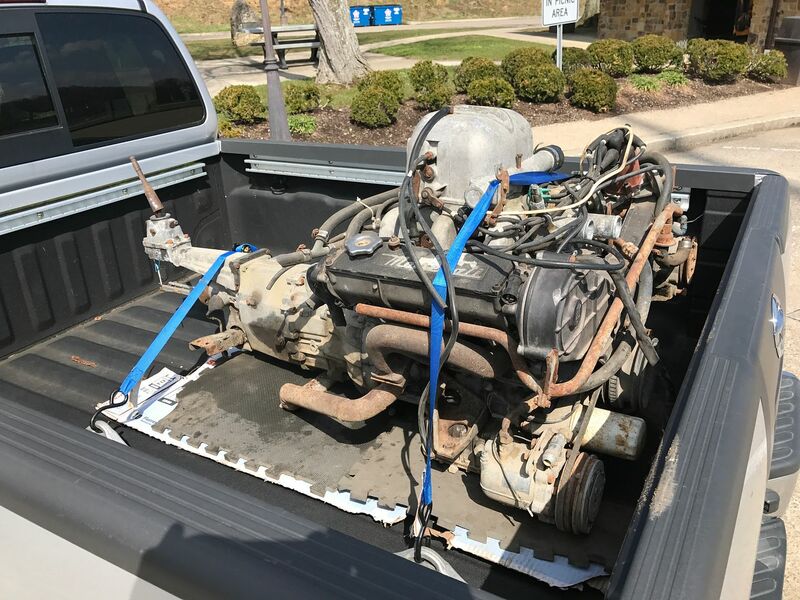 I happy and glad my old engine will get used. I will definitely like to see how this beautiful car will turn out with that engine. Speaking of your car I just now read though you thread and nice find on a very clean ride! I have a soft spot for pearl white. Thanks Paul! I'm excited to get things moving on this. 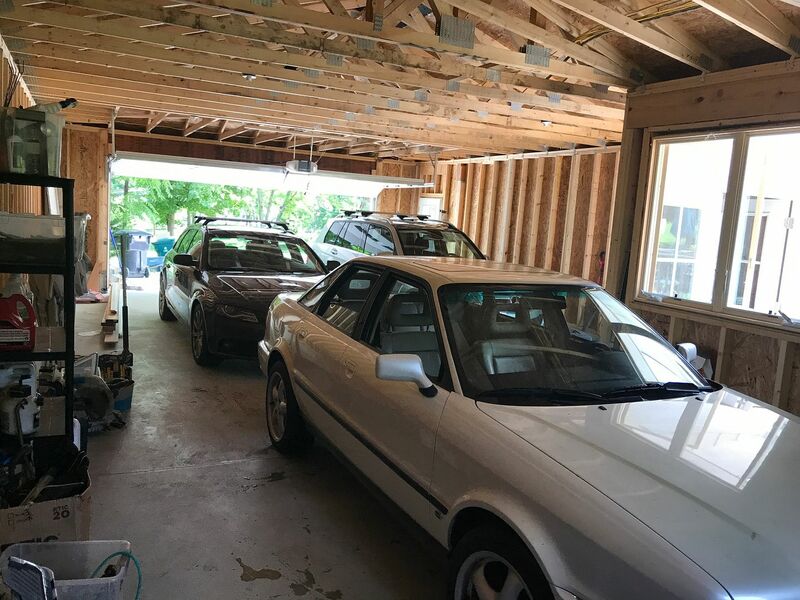 I have a garage being built starting April 3 so I'm not doing anything for a while. But stay tuned! Welcome. That's awesome that your garage will get built! They are sure nice to have to work in to keep yourself out of the elements. 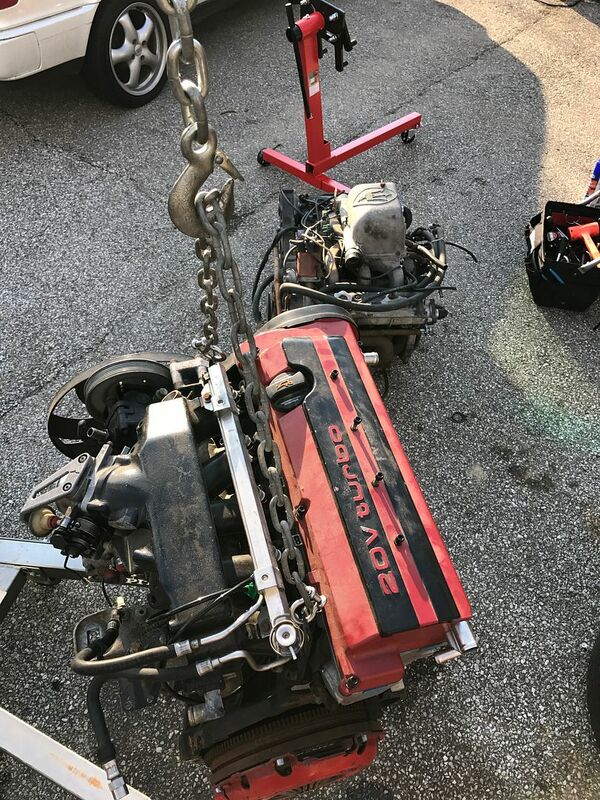 I had to zoom in on the pic of engine because I couldn't tell what was in the background (since I'm using my old phone for internet use) and that's the other engine you picked up the day before. Yeah. it's the Maserati Engine. Why do some people swap to a non-serpentine belt? Why Do I need a 7a oil pan and pickup? Why the Windage tray from AAN and double gaskets? Why a 3B water manifold? Will I need a 7a thermostat housing? I'll need an Intake manifold if I want to use AAN valve covers right? I could use 3B but then would need a 3B or 7a valve cover? Do I need an aby fuel rail for IM? -To clear the subframe in small chassis, the pickup to match the pan. I think most people go to v belts because its easier than converting their alternators/powersteering pumps to serp pulleys, I used a vbelt pulley on the URQ to match my alt/ps pump. If you do use a v belt pulley you need to make sure you have the correct timing cog, there are two different cogs that look very similar. I used the 7a pulley to avoid the possible confusion, I think they changed the design at some point in the 10v 200's lifetime. If your alt and PS pump have serp pulleys then I would imagine you can just use an AAN pulley. Ive seen people saying that the AAN pan doesnt clear a side mount radiator, but Ive also seen people saying it does in fact fit. In the URQ I went with a 7a pan just to avoid the chance that it doesnt clear, plus the 7a pan has a higher capacity which is always good. Windage trays are always good to have, helps keep the oil in the bottom of the pan opposed to on the counter weights and crankcase walls. 3b water manifold because the AAN water manifold's outlet faces forward, same problem as using an AAN intake manifold. As for the 7a radiator and thermostat housing not 100% sure. I would kinda assume the 7a radiator is basically the same as the 200 20v or URQ or any other side mount radiator. From what I remember 3b intake doesnt clear the AAN valve cover, I went with a 7a(over 3b) valve cover because I went to ls2 coils(firewall mounted). Fuel rail you need to match to the intake manifold I think. I remember I had an AAN fuel rail/FPR(to use on 3b intake) and one of the lines/FPR interferes with the 3b intake manifold. I'd thought that some of the accessories moved to the other side with this setup. This project has ben on hold for a bit while I built a garage. I need to source the left corner light but these are in phenomenal shape. I can't wait to install! anyone happen to have a corner and a license plate tub? Long time no post! Most of my time and money has been put into the Maserati Biturbo I picked up last January that now finally runs. Anyway, I finally have a plan and pulled the trigger on some go fast parts for this thing! The AAN I have has 7A cams and IE forged rods, ARP studs and has not been run since assembly by a machine shop. I hadn't really looked inside at all since I picked it up last year but I took off the valve cover and replced teh intake manifold, water manifold etc and got a good look - it's super clean! I'll run a Wagner EM too. I can't wait to get the parts and get to figuring out how I'll fit everything in there. The tail lights look great! That car needs a serious altitude adjustment though... Will be very interesting to see how you go about making the i5 mount up in there. yeah - it's definitely tall! I have the frame rails out of a coupe quattro that I'll have to weld in if I can't make brackets to keep the V6 mounts there. we'll see! One nice thing about starting with a b4 that had the 2.8 is you get the subframe that lines up perfectly for an 01e swap. And the b5 rear suspension. Tails look great on the pearl white, and I'm with Dave... this thing needs some v1's STAT! I have an 01E that I bought just before I sold my V8 coupe. That’s part of the plan too but not sure if it’ll be right away or later. As for coil overs, I will likely just get lowering springs. I did quite a bit to the suspension already- just needs springs. I’ll add in on a couple of these since I’ve done both in B2 and b3 cars. He serpentine belt is easy to service and remove to get to other parts . Doesn’t require as much adjustment , etc. also one of the biggest advantages, if you run a front mount intercooler down low that Serp Belt crank pulley opens up some space down there . Sometimes it may come down to which parts you have and what’s available to you. 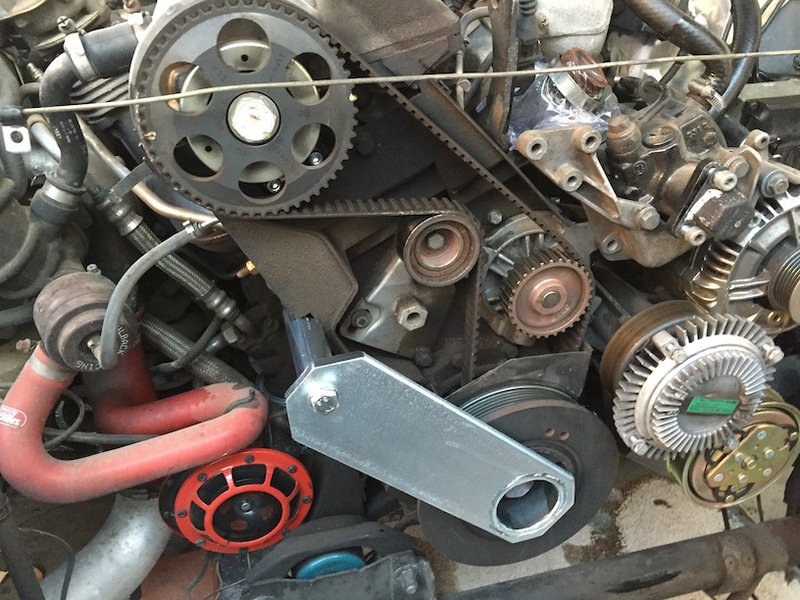 Running the serpentine belt requires the appropriate crank pulley and brackets for the accessories from the AAN . So if you’re starting with v-belt you’d have to swap everything. On my b3 I ran serp and it was sweet. In my B2 URQ I’m running v belt - it was easier to fit everything where I wanted it using the brackets from 7A. Long story short either can be done with some work and sourcing of parts. With it without ac or forward facing intake manifold . The 7A pan yes, and pickup tube is specific to that pan (aan one is a little different). If you compare the two pans side to side you will see that on the drivers side , where the bottom corner of your radiator is . You have about an extra inch or more of clearance there , the stock CQ rad would hit the AAN pan. 3B manifold has better orientation of the water inlet to the head for your 3B intake . They are BLA but they can be found . I found one but it was like $140 , still new. 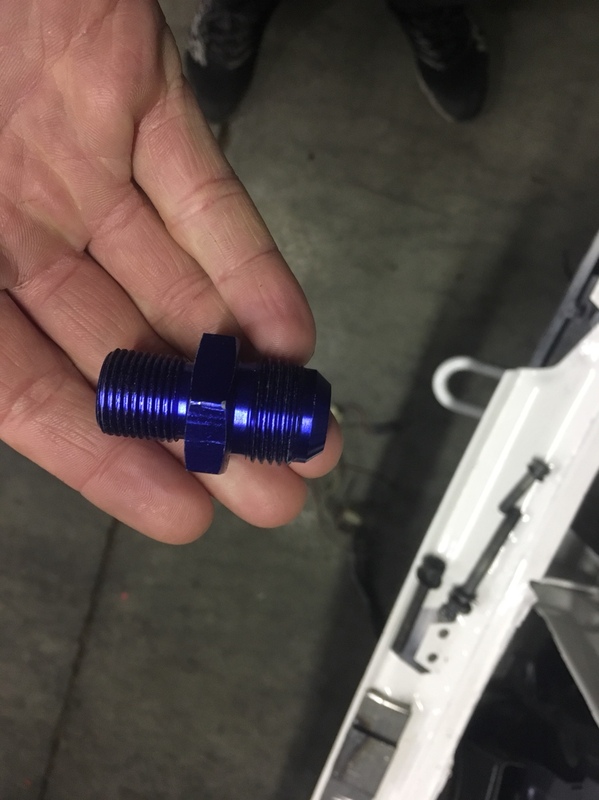 If you cannot find one , if you’re a welder or know someone that can weld aluminum casting you can modify the AAN one to Work as well. THe stock radiator will fit with that 7A pan. A lot of people get rid of the auxiliary radiator and have seen no II’ll effects but having a good belly pan and the shroud is a good idea . Probably the best bang for your buck , the “Winner Racing” one on eBay is pretty affordable , and the advantage to that one is that i think it will fit your stock shroud or an RS2 shroud for bigger 200W Fan. The 3B fuel rail will work. 034 also sells one . And Marc has one that’s even better quality . The 034 if you order that one requires a tight 45 right out of it to clear the 3B intake . It’s close but it will work. Go from your stock fuel line in the bay to -6 AN. Grillage wrote: I have an 01E that I bought just before I sold my V8 coupe. That’s part of the plan too but not sure if it’ll be right away or later. As for coil overs, I will likely just get lowering springs. I did quite a bit to the suspension already- just needs springs. Is the 01E 6 speed or 5? And which flywheel are you running ? If you run the stock trans now , and convert to 01E later I think If you get your setup right all you’d have to do is change the clutch disk out to fit the different sized trans shaft. There is a place on the S2forums who sells a really nice set of 01E small chassis mounts and took week to receive once I paid . bn-01-wso is the username $130 euros shipped. People told me the stock trans is weak with AAN but I’m not sure where the limit is. 01E definitely stronger . This is all very helpful! Thanks! I am definitely interested in keeping the AC and I’m planning to run the serpentine belt from the AAN. I have all the AAN accessories as well. The 01E I have is from a B5 S4 - so 6 speed. I will definitely hit up the guy from S2forum. I've done the LWFW and I didn't mind the low RPM chatter and liked the quick rev feeling but I think of people do prefer the stock FW . If you decide you don't, a good middle ground is the 7A Steel Flywheel. On the brackets, I guess if you have all AAN stuff you don't need anything from 7A to get PS pump setup because that's included in the AAN brackets. I think you'd still have room for the radiator (I did but mine was "tilted ") I ran a stock line but with an steel AN 45 degree fitting out of the PS pump to get angle the power steering out line closer to the block.